The Ness Counseling Center offers a comprehensive clinical internship/practicum program that provides education and practical hands on experience. Individual and group supervision led by licensed professionals is key to integrating what you learn in school and how to apply it in treatment. As well as the practical experience of providing treatment, we have trainings that help interns and trainees acquire the tools to provide appropriate services to clients. Interns and Trainees will be required to attend individual and group supervision on a weekly basis in order to maintain the level of competence needed to provide treatment and to meet the minimum requirements for licensing. Interns, post-graduate, need 1 unit of supervision for every 10 clients they see. Trainees currently enrolled in school require 1 unit of supervision for every 5 clients. Supervision will be integral in the interns growth and ability to create a support network. 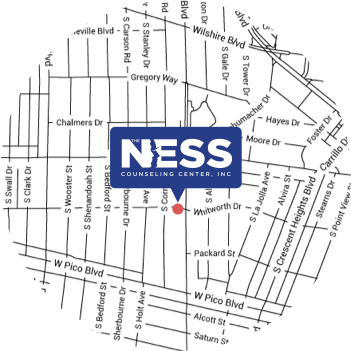 The Ness Counseling Center requires a minimum of a 1 year commitment. We provide individual and group supervision on a weekly basis and training for clinical enhancement. We begin our enrollment process in January accepting applications until April. We review all applications and invite potential candidates to interview. Practicum starts the last week in August. All internships are 18 hours per week. Bilingual candidates are a plus but not a requirement. Eclectic therapy is a therapeutic approach that incorporates a variety of therapeutic principles and philosophies in order to create the ideal treatment program to meet the specific needs of our clients. The clinical staff here at The Ness Center has a solid understanding of each theory for which techniques are being used in the eclectic approach. Some the theoretical approaches that we use in this eclectic modality include cognitive behavioral, psychodynamic, art therapy and family systems to name a few. Along with eclectic therapy we have incorporated a mindfulness based approach which includes redirecting the clients focus and utilizing meditation to become mindful and accepting of the present situation and what it has to offer, regardless of whether it’s good or bad. Interns and Trainees are encouraged to build a mindfulness practice in their own professional and personal lives in order to learn how to apply it to their clinical work. Interns and Trainees must have a Masters degree or be enrolled in a masters level program at an accredited college/university. Letter that you are in “good standing” if you are still in graduate school or a transcript from graduate school if you have completed your M.A. and are applying for an internship. All Trainees and Interns are required to have a background check, health clearance, and TB test prior to beginning their volunteer experience.